The great advantage of this pump is that it draws the water directly through itself from the entrance to the exit, and when placed perpendicularly draws the water in a straight column from the bottom to the discharge. It has but two valves, which can be taken out by simply taking the cap off the pump, and as a fire engi le for farm houses or manufactories it is admirably adapted. It does not freeze, and is very cheap. The operation is easy and perfect, and it requires little power, as we can testify from a personal trial. Fig. 1 is a vertical section, showing the buckets at half stroke, and Fig. 2 the same section, with the buckets at the termination of their outward stroke, shown in elevation. A is the body of the pump, the interior of which forms a chamber, permanently closed on one side, and furnished at the other with a packed cover and stuffing box. Through the stuffing box passes one end of the rock shaft, C, the other being in a bearing on the permanently closed side of A, and the rock shaft has a handle, D, attached to it outside. Secured to the rock shaft is the double lever, E, to one arm of which, e, is attached one end of a connecting rod, F, the other arm, e', being jointed to a connecting rod, G, the other end of which is jointed to a bridge, i, on the bucket, I, the opposite end of F being also secured to the bridge, 1c, on the bucket, H. The bucket, I, is arranged to slide in the barrel, a, and H in the barrel, a', I, having an ordinary conical valve, m, opening inwards, and H a similar valve, n, opening outwards, both buckets being formed of two pieces secured together, and furnished with the usual leather packing, p r, between.. The interior of the two barrels communicate directly with the chamber, A, and their extreme outer ends are furnished with flanges, to which are secured suitable pipes—the auction pipe to the barrel, a, and the force pipe to the barrel, —/. The operation is as follows:—A vibrating motion being imparted to the lever, D, either by hand or power, the buckets, H I, will, through the rock shaft, C, lever, E, rods, F and G, be moyed backwards and forwards in their respective barrels, the two buckets invariably moving in contrary directions. Supposing the bucket, I, to be moving inward, and the bucket, H, consequently outward, the valve, m, of the former will be closed, and the valve, n, of the latter opened, and the water already thrown into the chamber, A, by the previous action of the pump, will be forced through the bucket, H, into the discharge pipe, while the water from the suction pipe is flowing into the barrel, a ; this is continued until both buckets have reached their extreme inward stroke. The moment the buckets, by the reverse motion of the lever, D, commence their outward stroke, the valve, m, will be opened, and the valve, n, closed, allowing the water already filling the space in the barrel, a, outside its bucket, to rush through the latter into the chamber, A, at the same time, that the water in the barrel, a', outside the bucket, H, is being forced through the discharge pipe. It will now be seen that in whichever direction the buckets are moved, the water will be directed to the force pipe in a stream, the continuity of which is only momentarily interrupted at the point where the buckets reverse ; and even this check may be avoided by attaching the ordinary air vessel shown in dotted lines, Fig. 1. There are no curved passages, so common to double-acting pumps, and all the consequent disadvantages are avoided. The inventor is W. H. Harrison, of 705 Lodge Alley, Philadelphia, and he may be addressed for further particulars. 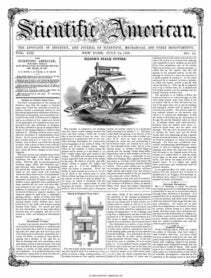 It was patented June 23, 1857.